Ghostface has one of the best catalogs in hip hop and he has quite a few classics. 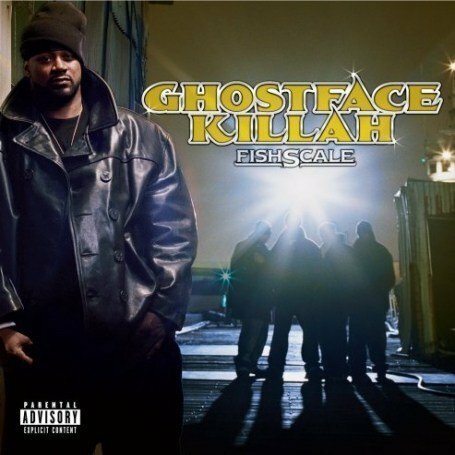 One of those classics is Fishscale, his 2006 album that sometimes seems to be overlooked at times, but it is greatness. The album kicks off with "Shakey Dog", the soulful funky boom bap track as Ghost spits some fire welcoming us into this experience. In what could be seen as an anthem, "Kilo" and its infectious hook sees Raekwon and Ghostface talking some of that good ol' coke talk over a dope beat. Ghost takes a booming Just Blaze beat and goes nuts on "The Champ", spitting some of his dopest verses ever. It was obvious that Ghost is hungry again on this album. The MF Doom produced "9 Milli Bros" features the whole Wu Tang Clan spitting together, creating a classic track in the process. Ghost ends up getting some production from J. Dilla on this album, starting with the smooth "Beauty Jackson" allowing Ghost to do what he does best, and tell a story. That is one of Ghost's best attributes: storytelling. He has a couple of skits next before moving into the track "Crackspot", with a soulful track that he coasts over easily. One of my favorite tracks on the entire album is "R.A.G.U. ", a collab with Raekwon over a hard knocking boom bap track. Anytime Ghost and Rae team up, it's dope, but this one is special. Another J. Dilla produced track follows, with my favorite song on the whole album "Whip You With A Strap", as Ghost tells the story of growing up and being a bad kid and the discipline he received. The smooth and soulful production here carries the track, as Ghost coasts over it. The first single, the Ne-Yo assisted "Back Like That", shows Ghost going back to familiar territory, detailing a breakup as only Ghost can. The song sounds a bit more commercial due to the hook, but the song is extremely dope and feels like it is in Ghost's comfort zone. "Be Easy" and "Clipse Of Doom" are both amazing aggressive tracks, and Ghost keeps the cohesion on point during the entire album. The production here is flawless throughout. The brief track "Barbershop" has a dope beat, with a beautiful soul sample carrying it, as Ghost kicks a short verse. The obvious sample on "Big Girl" is still too smooth to deny, as Ghost raps over the entire actual track versus a small sample, something he has done quite a few times in the past. The dope "Underwater" is a very smooth listen, and a creative track as Ghost penned the song from the perspective of moving under water. Closing the album out with "Momma", Ghost dedicates the song to the women going through a lot and making it work. The hook provided by Megan Rochell fits perfectly and Ghost makes sure to provide some heartfelt verses to drive the point home. Ghost created an amazing album here with virtually no flaws. If you don't remember the true greatness of this album, be sure to go back and revisit this classic work. Thank me later. Drake and Future: The MVPs of 2015?? A Place Called Twitter: Has Feminism Ruined It?